Athletics pitcher Daniel Mengden is Friday’s Box-Toppers Player of the Day. Also Friday, Yankees pitcher Luis Severino rises to fourth place in Box-Toppers season player rankings and Diamondbacks pitcher Robbie Ray rises to 10th after both earned Player of the Game honors. Plus, Red Sox pitcher Chris Sale failed in his chance to rise to the Box-Toppers points lead after he did not earn Player of the Game honors in his team’s win. Player of the Day—Mengden pitched a complete-game, two-hit shutout, striking out seven and allowing no walks, in the 4-0 win over the Phillies. This was Mengden’s second career Box-Toppers Player of the Game honor. Interestingly, the only other time he earned Player of the Game was exactly one year ago on Sept. 15, 2016, when he was also Player of the Day. He has 4.0 career Box-Toppers points. National League Player of the Day—Dodgers pitcher Alex Wood struck out eight over six scoreless innings, allowing three hits and one walk, in the 7—0 win over the Nationals. Wood earns 1.7 Box-Toppers points for being NL Player of the Day, giving him 15.7 for the season and rising to 11th place among all players, sixth among NL pitchers. National League Batter of the Day—Kris Bryant of the Cubs homered and went 3-for-4, scoring twice and driving in two runs, in the 8-2 win over the Cardinals. American League Batter of the Day—Xander Bogaerts of the Red Sox went 4-for-7, scoring twice and driving in two runs, in the 13-6, 15-inning win over the Rays. Yankees pitcher Luis Severino (8IP 3H 2R BB 7K W) earns Player of the Game honors Friday in the 8-2 win over the Orioles. He becomes the fourth player this season with 20 or more Box-Toppers points (20.1) and rises from seventh to fourth in player rankings, second among AL pitchers, behind Red Sox pitcher Chris Sale (23.1). Severino has earned Box-Toppers points for three seasons. In 2015, he had 3.0 points and in 2016, he had 2.0, both with the Yankees. Diamondbacks pitcher Robbie Ray (7IP 6H 2R 1ER 0BB 10K W) earns Player of the Game honors Friday in the 3-2 win over the Giants. He rises back into the top 10 after a one-day absence, rising from 11th to 10th place with 16.0 Box-Toppers points. Anthony Rizzo of the Cubs (15.5 Box-Toppers points) falls out of the top 10 after spending just one day there. On Thursday, he rose into 10th—the first batter since June 27 to occupy a top-10 spot—pushing Ray to 11th. On Friday, he was passed by both Ray (16.0) and Wood (15.7) and is pushed out of the top 10 to 12th place overall. Box-Toppers points lead—Red Sox pitcher Chris Sale failed in his chance to take the overall Box-Toppers points lead in his start Friday. Sale (5.2IP 6H 4R 3BB 9K ND in the 13-6, 15-inning win over the Rays) had a Box-Toppers game score of -2.8. Player of the Game was teammate Xander Bogaerts with a Box-Toppers game score of +1.0. Bogaerts was also AL Batter of the Day. Sale has 23.1 Box-Toppers points on the season, the same total as Dodgers pitcher Clayton Kershaw and would have taken the outright lead if he had earned at least Player of the Game honors. Sale ranks second to Kershaw on a tiebreaker—Kershaw had more 2016 Box-Toppers points than Sale, 24.4 vs. 13.4. Team rankings—The Los Angeles Dodgers Friday regained the Box-Toppers team rankings lead after losing it earlier in the week. The Dodgers rise from third to first place as they defeated the second-ranked Washington Nationals. Alex Wood, who earned Player of the Game for the Dodgers in the win, also earned NL Player of the Day honors, giving the Dodgers 1.7 Box-Toppers points. In addition, the Cleveland Indians, who took the team rankings lead on Wednesday, had their 22-game win streak come to an end Friday and so added no points. 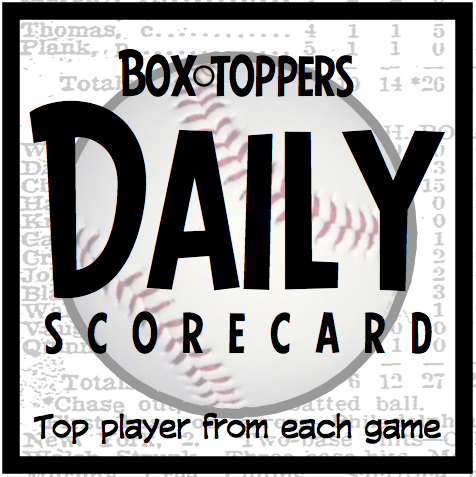 Dodgers 126.9 Box-Toppers points, rising from third Thursday to first Friday. Indians 126.7, falling from first to second, just 0.2 points behind the Dodgers. Nationals 125.9, falling from second to third. The Dodgers took the Box-Toppers weekly team rankings lead on June 22 and held the top spot through Sunday, Sept 10, when they were passed by the Nationals, who held the lead three days. The Indians passed the Nationals on Wednesday, Sept. 13, and held the lead two days. Notable—Rockies pitcher Tyler Chatwood earns Player of the Game honors for batting, the seventh time this season a pitcher has done that. Chatwood (1-1 R 2BI in the 6-1 win over the Rockies) had a Box-Toppers game score of +3.0 for batting. He had a game score of +1.2 for pitching (5.2IP 4H R BB 3K W). Scoring—Mengden earns 2.0 Box-Toppers points for being Player of the Day and Wood earns 1.7 points for being NL Player of the Day. Bryant and Bogaerts each earn 1.5 points for being their league’s Batter of the Day. All of Friday’s other Players of the Game (listed in the chart below) earn 1.0 Box-Toppers point.